The city that never sleeps- New York, New York! With world famous museums and architecture, Broadway shows, and distinct neighborhoods with their own culture and amazing food, any traveler can find a good reason to visit the Big Apple. Even cruisers have some great excuses to visit Manhattan. 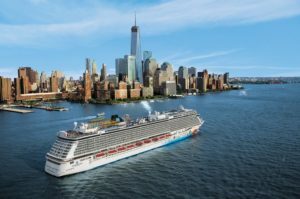 New York City is home to Norwegian Cruise Lines Breakway. This distinctly New York mega ship contains one of a kind entertainment and food sure to appeal to the masses. Not to mention, New York city is only a few miles away from Cape Liberty Cruise Port, the soon to be home of Royal Caribbean’s newest ship, Anthem of the Seas. 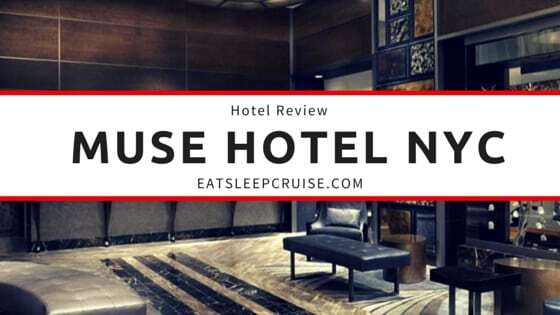 If your cruise adventures are taking you to Manhattan, and you are looking for a place to stay, the Muse Hotel New York might be the perfect place. 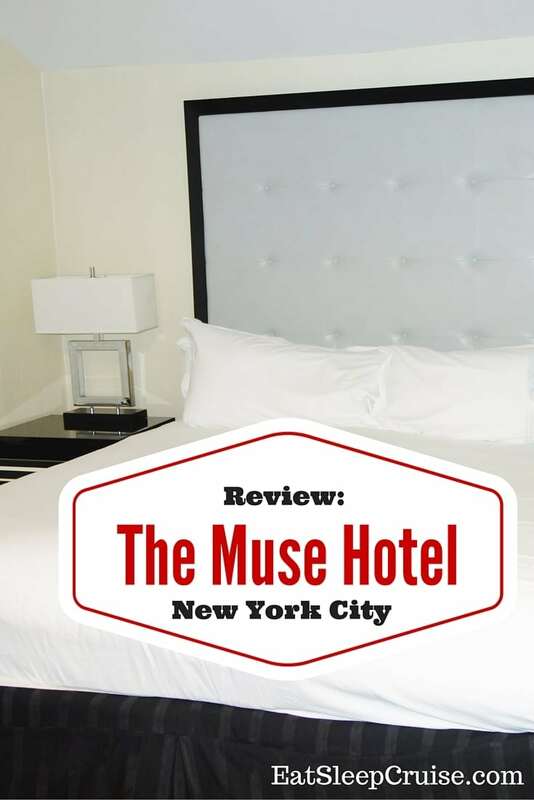 Here is our complete, Muse Hotel New York Review. 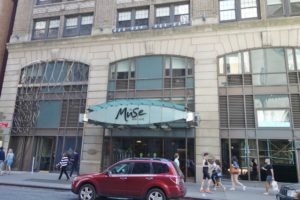 Shockingly, our visit to the Muse Hotel New York had nothing to do with a cruise. Instead, we had plans to see a Broadway show and enjoy the Memorial Day weekend in the city. Given that we wanted to be near Times Square and the theater district, we focused on hotels within that area. This hotel is also less than two miles from the Manhattan Cruise Terminal, home to NCL Breakaway and NCL Gem, so this hotel is definitely worth considering if you are cruising from that port. 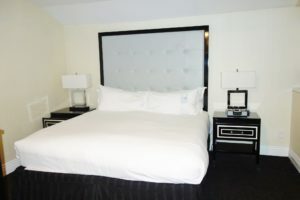 The Muse Hotel New York is located on 130 W 46th Street, which is between 6th and 7th Ave. Arriving at the hotel, we were greeted by a friendly attendant, who would valet my Jeep. The parking rate is $55 a day for cars and $65 a day for SUVs (plus applicable taxes), so perhaps taking some form of public transit would have been more economical. The hotel is only half a mile from the New York Bus Terminal and about a mile from Penn Station, if you do not dare to drive into the city. The exterior of the Muse Hotel New York is rather subdued with a small, well lit glass awning. 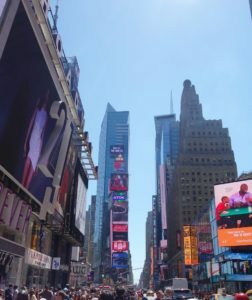 Being surrounded by the flashy lights of Times Square and the local restaurants and pubs on 46th Street, this hotel has a quiet, unamusing veneer that was a perfect retreat for us suburbanites. 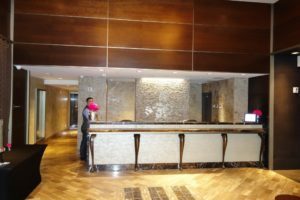 The hotel lobby is a welcoming space, appearing very sleek and trendy. 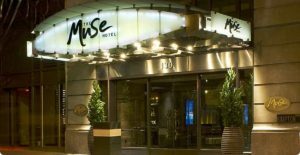 Like other Kimpton Hotels, the Muse Hotel has clean, modern decor and atmosphere. With the warm and cozy touches, you might almost forget that you are in the middle of one of the largest cities in the world. The lobby is on the smaller side, but then again, we are used to sailing on cruise ships. And cruisers have perfected the art of making the most of tight quarters, so it didn’t bother us. After all, it was still big enough for the wine reception! 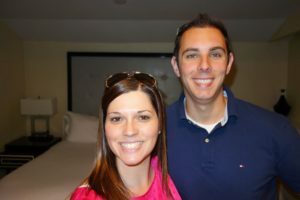 Upon arrival at around 1pm, we were quickly checked in and given keys to our room. 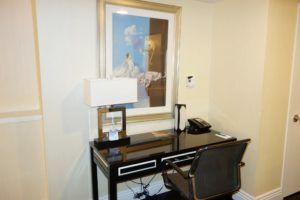 We were actually surprised that the room was ready, but perhaps being a member of Kimpton’s Karma rewards program may have helped us get into our room a bit early. More great perks of this program, besides staying at these fun and sophisticated hotels, include a “raid the mini-bar” card with $15 value and free WiFi during your stay. Located on floor two, we took the elevators to the right of the front desk up one flight. Yes, we could have walked, but during our attempt at finding the stairs, we somehow ended up in an employees only area. Oops! The second floor is also where you will find a small fitness room which is open 24/7 and requires key card access. Being at the hotel for only one evening, I did not try out any of the equipment. Upon entering our room, we were greeted with a small hallway, that opened into the main sleeping quarters. There was a small desk with an ergonomic chair off to our right. To our left was a bathroom that had a huge mirror and nice long vanity shelf for storing toiletries. 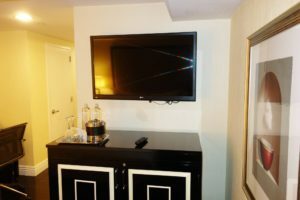 Across from the bed, a large flat screen TV hung over a cabinet that included extra storage and the mini-bar. Despite our voucher, we did not raid the mini-bar; instead, we applied our $15 credit to the tab at the Nios Restaurant where we grabbed a round of drinks after the show. 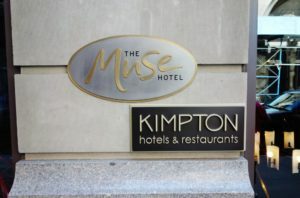 Having stayed at several other Kimpton Hotels in the past, The Muse definitely had the same feel, but it did show some signs of wear. This was most noticeable in the bathroom, which could have used some TLC. The hotel is in the process of some repairs and upgrades, so we have no doubt that these already nice rooms will be brought up to Kimpton’s high service standards in no time. What really stands out for us when staying at Kimpton Hotels is the level of service and the amenities that come with staying at these boutique hotels. Accordingly, the Muse Hotel New York has a nightly wine reception from 5pm to 6pm, where complimentary wine is served in the lobby. This event is always well attended, and while we did grab a glass of wine, we were already running late for our dinner reservation, so we did not stick around to mingle. The hotel also offers guests complimentary bikes that can be used to travel around the city. This is a great amenity for those more adventurous city explorers. Kimpton Hotels are pet friendly. While not a big draw for us, this feature does appeal to many. During our stay, I believe we saw one dog, but that was it. Lastly, if you do ever forget anything, the hotel offers We Got You Covered amenities including everything from toothpaste to super glue. For our one night stay at the hotel, we found the location was ideal and the price was right compared to other nearby hotels. 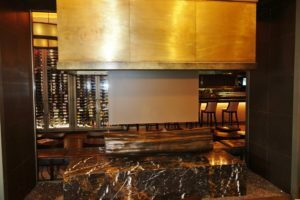 The staff were friendly and accommodating as always, and the restaurant, Nios, was a great, low-key spot to grab a drink. 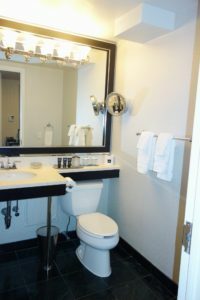 While we were a bit disappointed in the bathroom, overall, The Muse Hotel New York provided us with a lovely, comforting stay in the heart of the Big Apple. 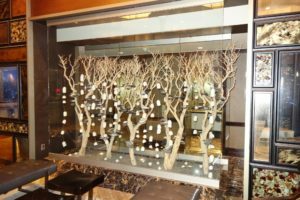 If you are visiting NYC for the weekend or planning a pre-cruise stay in the city, we would recommend checking out this hotel. Where do you like to stay when in New York City? Have you ever stayed at another Kimpton Hotel? Drop us an anchor below to help your fellow travelers find the perfect hotel for their next trip to Manhattan.